All week we had been debating on where to go for our Friday hike. The weather looked good, but there is still so much snow in the mountains. None of our ideas inspired us. No one felt like climbing a mountain; we didn’t want to go anywhere we had been before. We flipped through the Hiking With Kids book, just minutes before I was to leave to go to the nwhikers social on Thursday night. 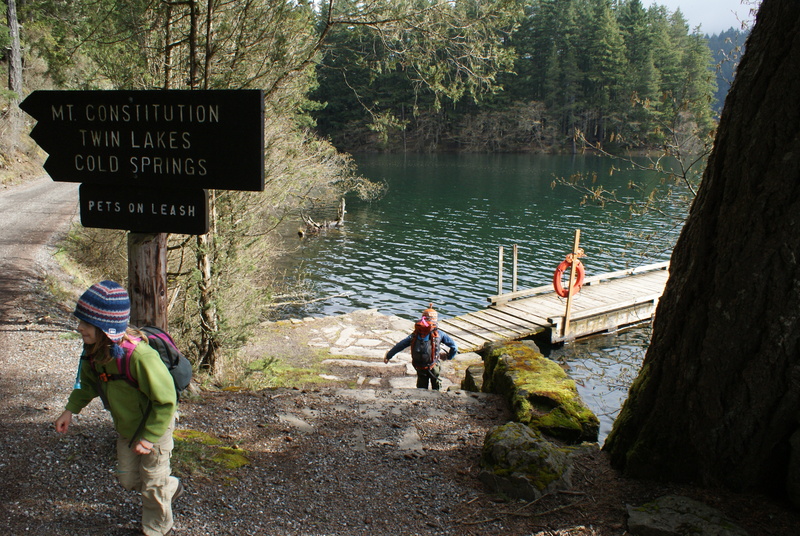 Moran State Park looked wonderful – there were lakes to visit, easy trails, forest and mountain, and best of all, the ferry. So off I went, giving the kids instructions for packing. I enjoyed the social, came home and packed late — then I was too excited to sleep. Oh well. I can always catch up later. The morning dawned a little too early for me, but I forced myself out of bed and hurriedly got us all ready and out the door before the sun rose. 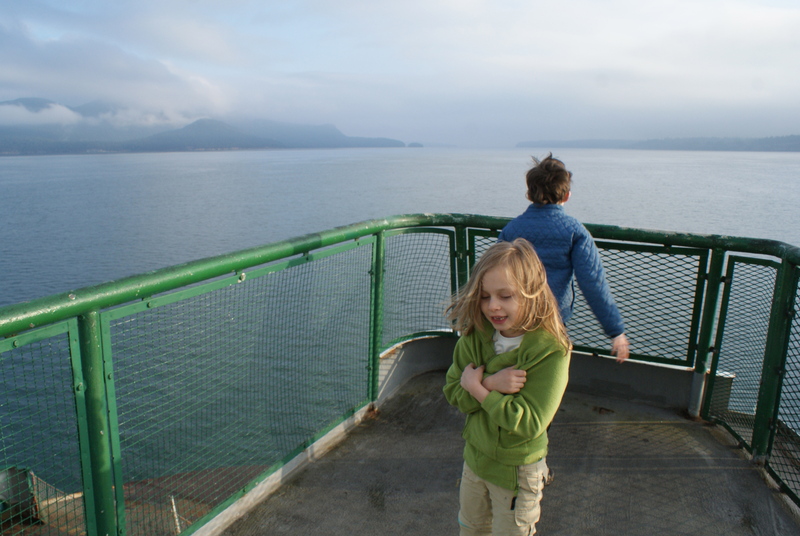 We needed to make the 7:30 ferry in Anacortes, and we were running a few minutes late. If we missed that ferry, we’d have to wait 3 hours for the next, making our arrival on Orcas Island later than we’d like. Thankfully no one had a bathroom emergency. The Cascades stood out in sharp relief against the orange sky behind them. Mt. Baker glowed with pink morning light before the sun rose over the Crest. We drove out of sunshine and into fog north of Everett. Dark clouds greeted us along Hwy 20, as we saw numerous eagles roosting in the trees along the road. I kept my speed at the limit through downtown Anacortes but in my mind I hurried us along. We arrived at the ferry dock in the nick of time to buy our ticket and board the boat. I breathed a sigh of relief; that was cutting it a bit too close! We enjoyed our ferry ride, observing the different islands and feeling hopeful about the sunshine peeking through the morning clouds. It takes about an hour to go from Anacortes to Orcas, and soon enough we were on our way on the island, to the other side, where Moran State Park is. We saw a few deer as we drove, and heard frogs along the way. We made it to the parking lot at Mountain Lake about 9:15 or so, and the kids enjoyed playing while I got our stuff together for our hike. 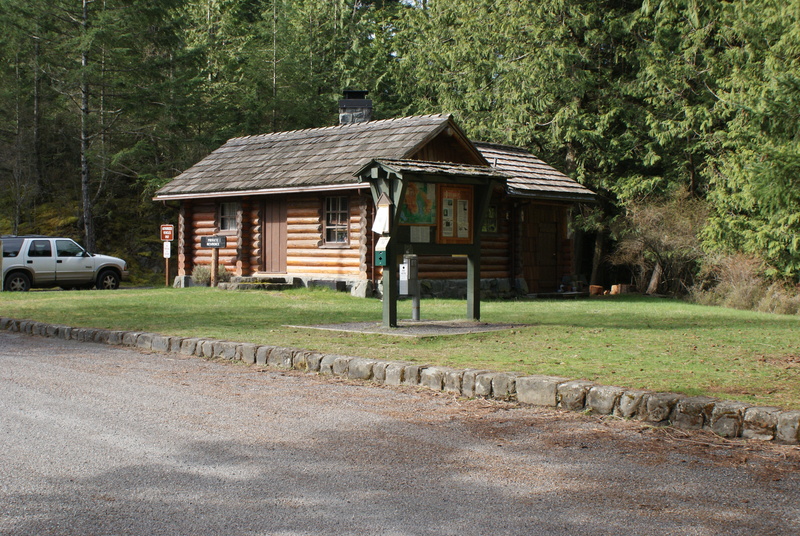 There is a cabin at the parking area, a picnic shelter, a restroom (closed!) and room for several cars. It was grey and cold, so we were bundled up. We only saw a couple of guys who were using the group camping area down below. 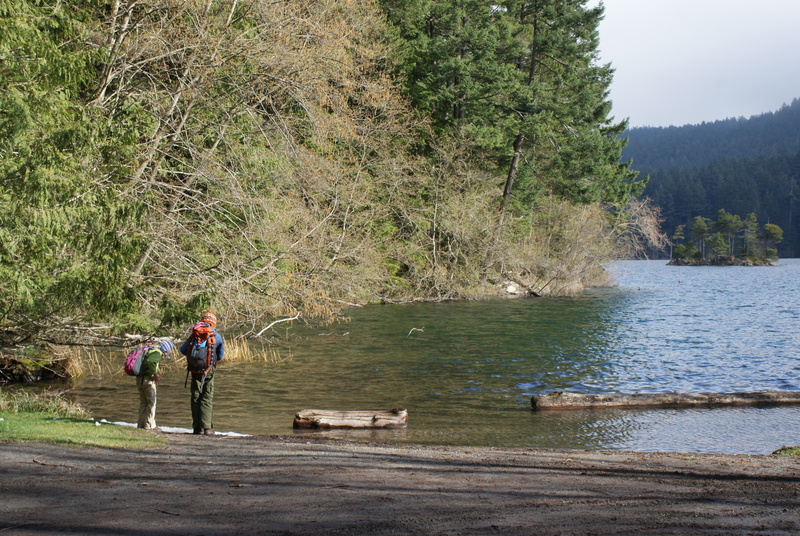 We started off along the road to the other campground, soon finding the true trail to the left of the boat launch area. 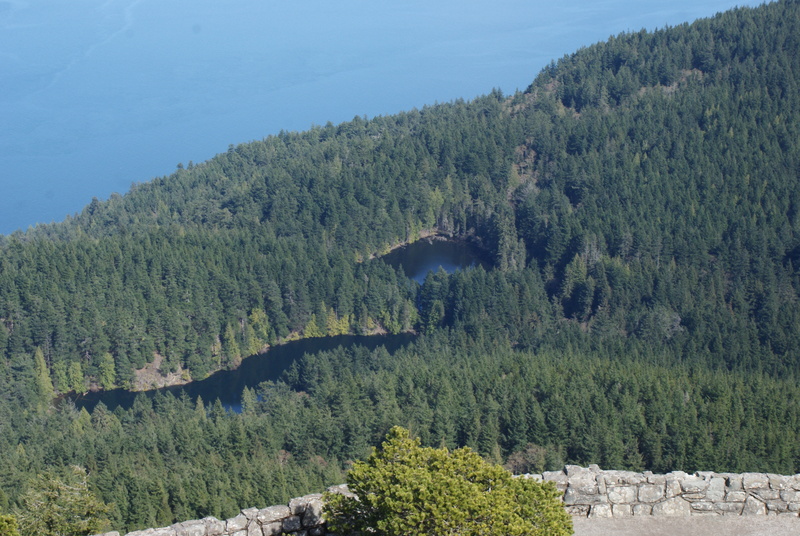 The trail follows the curvature of the lake, and you can hear the water lapping at the shore. 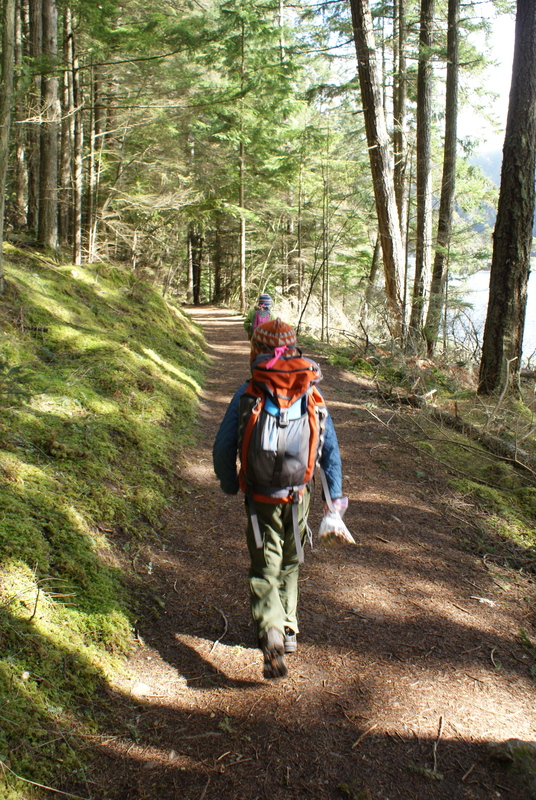 The trail itself is gentle and well maintained; but the sides are brushy in sections, with plenty of trees growing right down to the shore, so you won’t find too many areas for wading. 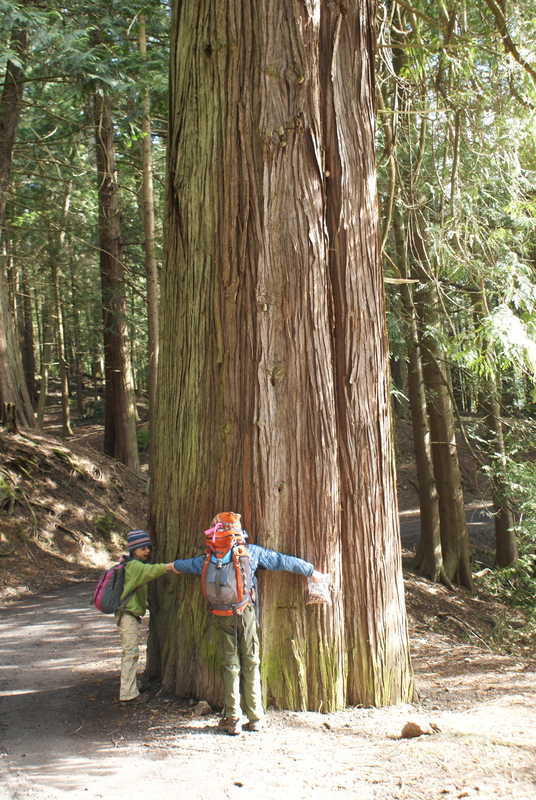 We marveled at the huge cedars and firs in the park, and thought the moss that covered everything looked so inviting. 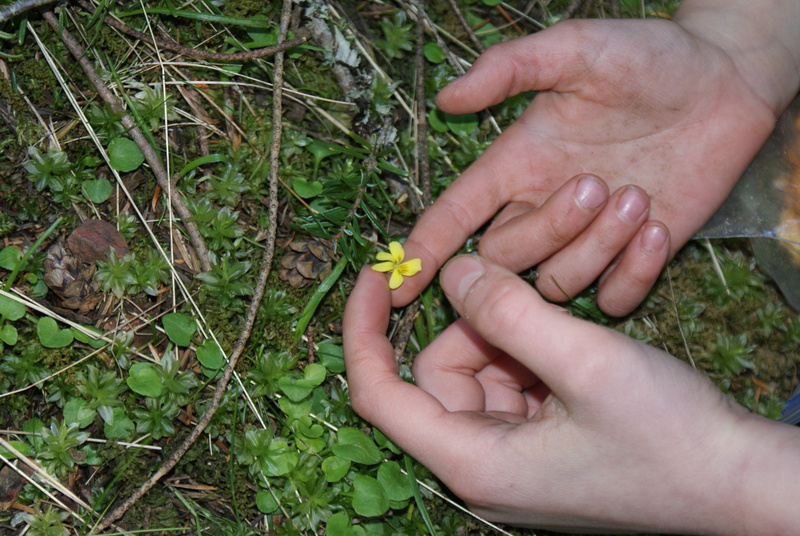 Tiny yellow violets were sprinkled here and there. Birds were singing all around us; varied thrushes, robins and white-crowned sparrows were the most common. At one point we saw a robin gathering twigs, and we were able to watch it fly up to its nest above the trail. We might have startled a bald eagle in the still morning, as suddenly we heard it chittering directly above us. We weren’t able to catch a glimpse of it, but that loud voice made us even more alert for a possible raptor sighting. We stopped for a break at a nice open area next to the water, soaking in the sunshine and having a snack. Swallows swooped overhead. 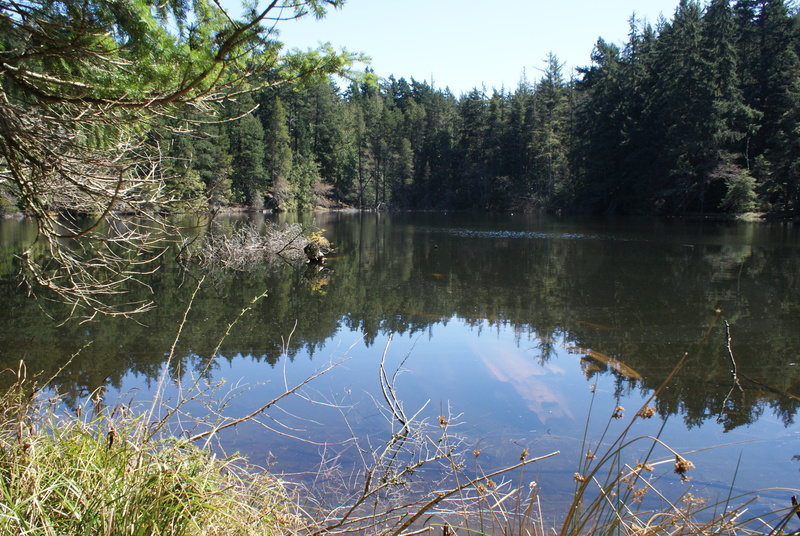 The water gently lapped against the logs that were washed up, and the alder trees and other shrubs were just budding out. It was so pleasant here, but we wanted to reach Twin Lakes, so off we went, continuing along the shore to the northern end of Mountain Lake. We looked up toward the cliffs to the northwest, and saw three eagles catching thermals in circles. Soon the loop trail continues to the right; we took the left fork and headed up away from the lake, following a magical fairy tale stream through the valley. From here it’s only 0.8 mile to Twin Lakes. Gabe declared he was going to take a nap at the lakes when we got there. Both the kids had been showing negative behavior and attitudes from their early morning wakeup call. There are some muddy spots along this portion of the trail, as it winds through marshy areas and past small ponds. 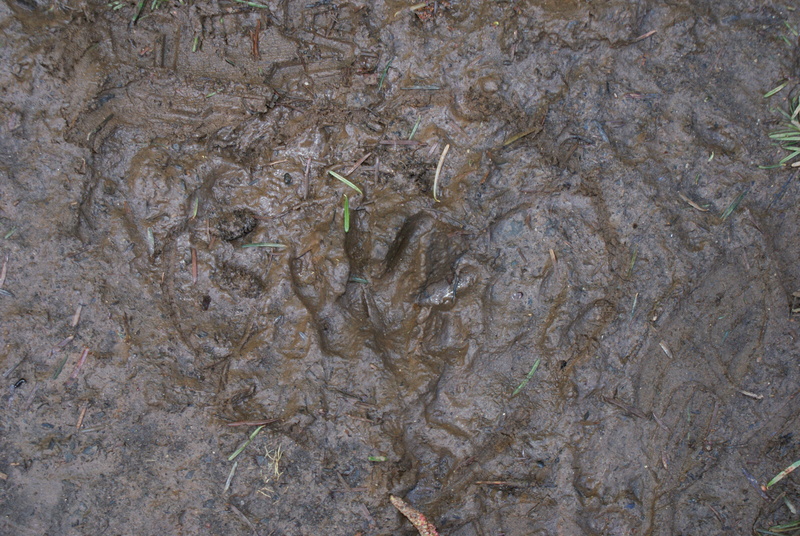 We saw the tiniest deer prints I’ve ever encountered, and tracks of raccoons as well. We were thrilled at one point to look up and see a bald eagle swooping through the trees in front of us, silently veering between the trunks. The white tail and head were clearly visible in the few seconds we saw it. Not long after that we reached the first of Twin Lakes, 2.2 miles from the parking lot. We could see the second just on the other side of a small rise, and we went over there to find a patch of sunshine. 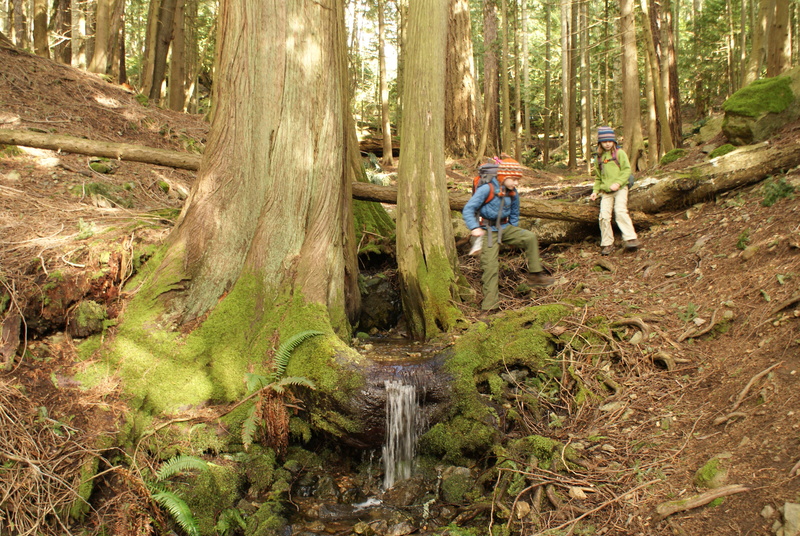 The kids set their packs down and immediately began running around, finding “territories,” and exploring. So much for taking a nap. A pair of buffleheads were swimming on the lake. A cold breeze from the north meant we had to keep bundled up. Then we got another thrill, as a large eagle swooped in and landed on a tree across the small lake. We were able to watch it with our binoculars for some time, and we are pretty sure it was a golden eagle. It sat on a large, broken branch and preened itself. It seemed like it was soaking in the sunshine as much as we were. We sat at the lake for about an hour. Gabe skinned his knee (we rarely make it through a hike without breaking out the first aid kit). Annika took her coat off and got chilled. So it was time to head back to the car. We made it back in about half the time it took us to walk there. We could have continued on the other side of Mountain Lake to complete the loop, but the kids wanted to go by the shortest route. Annika "shooting" her "bow and arrow"
We noticed many more fungi on the way back. 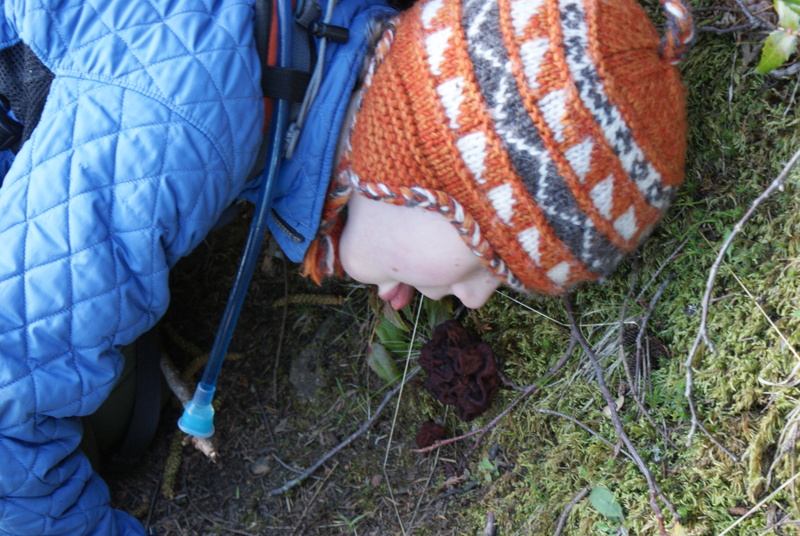 Gabe said he had seen some mycelium when they were playing at the lake. I was so proud, thinking he had read about them somewhere. So I asked him how he knew what mycelia were, and he said he learned about it from Minecraft, a video game! It’s a name of something in the game, and he had asked his Dad what the word meant. Oh well, at least he knew it. We were all tired when we reached the car. The restrooms at the campgrounds were still not open. We had enough time to drive up to the top of Mt. Constitution to visit the observation tower. 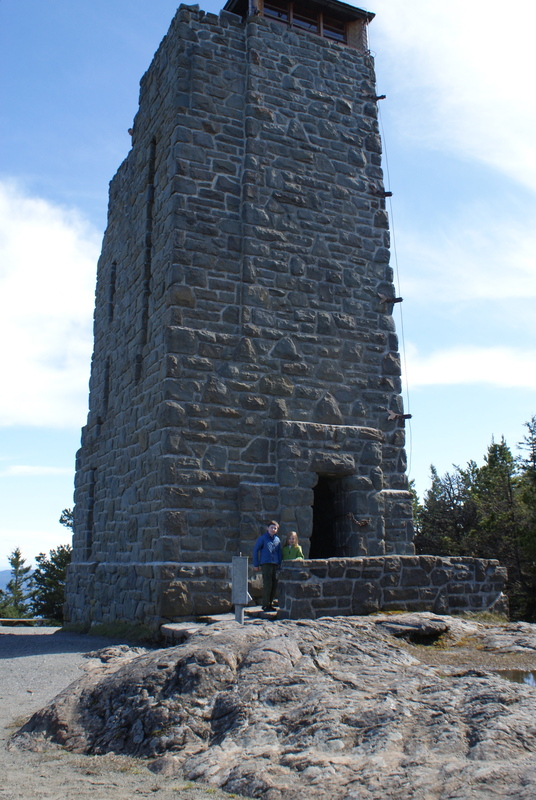 We climbed the stairs to the top of the stone tower, and took in the fabulous views in all directions. 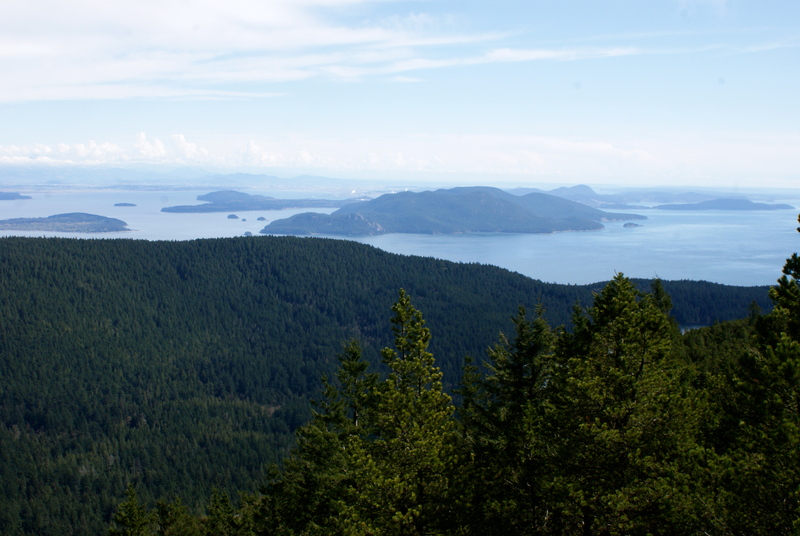 South to Whidbey, east to Bellingham, north to the Gulf Islands, west toward Vancouver Island and the sun. We could see Mountain Lake and Twin Lakes, where we had been all morning. We poked our heads into the gift shop and used the porta-potties, seemingly the only restrooms open in the park. 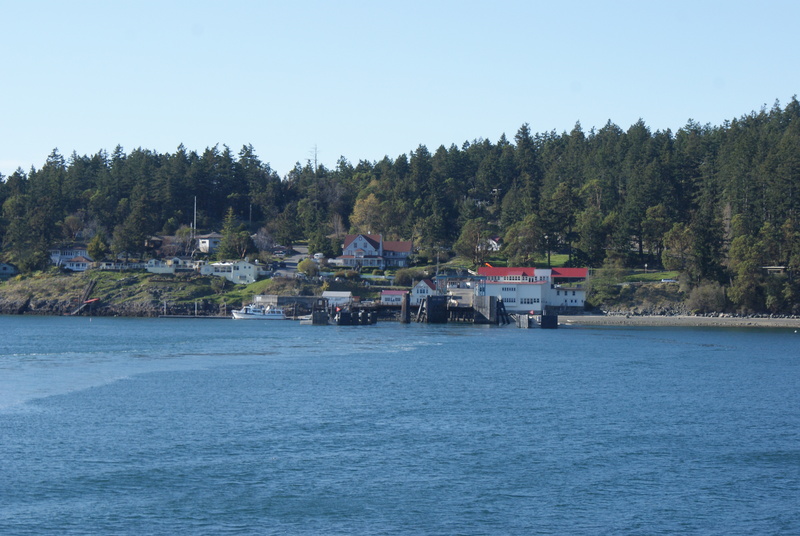 Then we drove back down the curvy, white-knuckle road, out of the park, and to the ferry dock with plenty of time to spare to catch the 5:10 ferry back to Anacortes (we spotted more deer and a bunny on the way). We stopped for coffee and cocoa at the friendliest Starbucks around, and made it home before dark. We saw tons of hawks and more eagles; so many raptors this day, we lost count. This was a long day for me, and the kids were worn out too. We had some bickering and discipline issues along the way. Annika cried in the car for the last hour home, as she realized we weren’t going to play at the beach at Deception Pass SP. Quick baths and bedtime snacks ended the day for my children. But they both thought the trip was totally worth it. 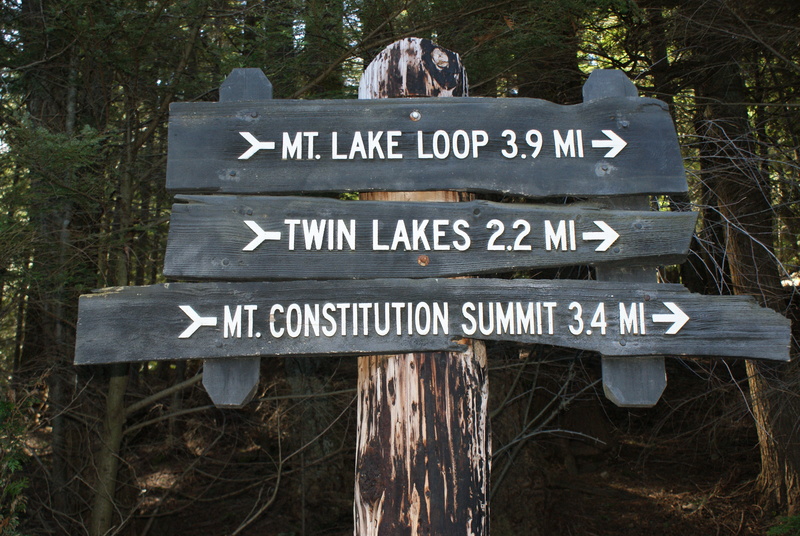 If you do this trip, there are plenty of options for hiking in Moran SP. Print out a map from the park website, or pick one up from the gift shop on the top of the mountain. Don’t forget your Discover Pass. This makes for a really long day trip, and if you do it in one day, I recommend catching the early ferry. 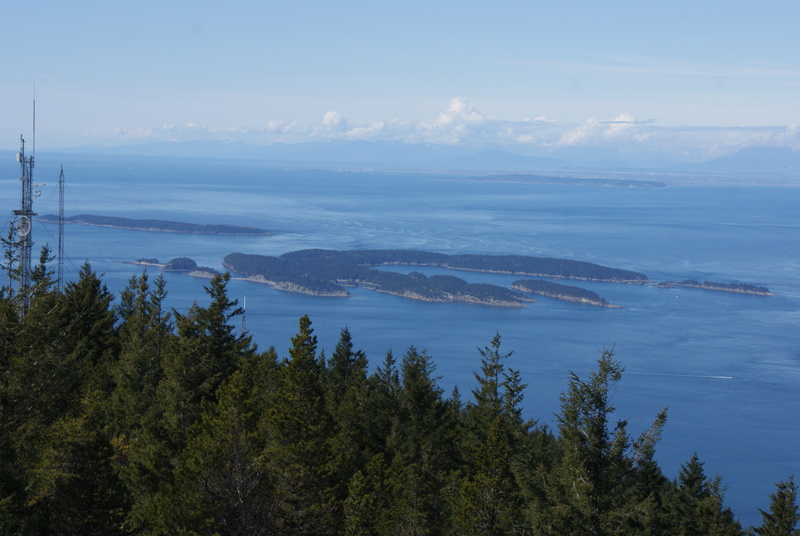 If you can spend the night or weekend on Orcas, that would make it easier. The campgrounds look OK at Mountain Lake, though you won’t get much privacy, as they are crammed together with no bushes in between. I can’t wait to get back and explore more of the trails on this fantastic island. Hi again, Place me on your list for new entries, please. I don’t see a place to write in my e-mail to receive them. Thanks for visiting my blog! I have been looking in the widgets for my blog, and I can’t seem to see one for an email feed. I’ll try to find something in a plugin or something. In the meantime, have you ever tried Google Reader? It’s a service where you can sign up for all the blogs you want to follow, all on one page. It automatically updates so you can see at a glance which blogs have new posts. You can read most of them on the reader, or go to the website. It’s a great way to keep up with blog subscriptions. Might be worth a try in the meantime. It doesn’t clog up your email, either. Again, I’ll try to see what I can find, but there isn’t an obvious way to let you subscribe via email. I’ve figured out how to add the subscription buttons. You can now subscribe to my website on the sidebar. Thanks!